This is the first of a couple of posts in a series about “make money blogging”, after the talk that was given at Britmums Live 2014 on this topic which I participated in. Subscribe to my blog, so you don’t miss out on the next one! This year, I went to Britmums, the blogging conference for parent bloggers, and I spoke there. Last year I helped the lovely Jen and Susanna out at the event, and the year before I was too scared to go as I was a newbie blogger and I watched it all unfold on Twitter. Over the last two and a half years, I have grown this blog from somewhere where I muse about life as a mum, to a place that parents and bloggers can come for advice, practical tools, and sometimes a bit of a laugh (I hope). As luck would have it, the site has also become somewhere that I can channel the creativity that I know I needed to express somehow when I gave up my work as a business analyst in 2010. My view of my blog was echoed by Katy Hill in her acceptance speech for her Fresh Voice award at Britmums. This blog has been the place where I could find that part of me that was defined by my previous job. After I became a mum, I felt overjoyed, but a little lost at the same time. KiddyCharts really has helped me find my little space in the world again. When I began this site, it was always going to be a business; the shape of that business has changed, but my aim was always for it to make money for myself and the family. In my journey, I have asked myself many questions about what the site was going to do, and how it was going to make money; and during some periods, whether I still wanted it to make money at all. At Britmums, I spoke on the new ways that you can use your blog to do just that – make you money. Why did I start blogging in the first place? To document a hobby of part of their life. Whatever the reason, it is always worth having it in mind when (and if) you start on your monitisation journey. You have to be comfortable with the direction that monitising takes you. It may turn your blog into something completely different from what it started as. You might be OK with that, but it is wise to ask the question and be aware of your answer right from the start. As your monisiting evolves, you may find that you want to start a new blog that focuses on more personal aspects of why you starting blogging. Alternatively, you could decide to start a separate blog that allows you to monitise without touching too strongly on the personal aspects that made you want to blog in the first place. Why do I want to monitise my blog? This is a fundamental consideration when you are thinking about monitisation, and perhaps one that is often overlooked. People start a blog, then realise they can make money from it, and just do because, well, they can. This isn’t a problem of course, and works fine on an ad hoc basis. However, if you are starting to think of your blog more in terms of earning potential, and even a regular income, it is advisable to develop at least a loose idea of why you are going to use your blog to make money. Are you doing it because you need to make money from it? Is is because for you, it is a measure of blogging success? Perhaps it might just be because everyone else is doing it? What is driving YOUR reason for monitisation has a bearing on how you monitise and what time you want to devote to it. If your blog needs to become another source of income, then the decisions you make about making money from your blog will be very different from those made by a blogger who is looking to make a little extra on the side. Make sure you are honest with the answers you give here as well. The reason why you are monising can have a significant impact on some of the other answers to thee questions, such as how much risk you are willing to take, and what investments you can make to generate more revenue. Person writing it – You! Perhaps the skills and services that you are offering to brands that might want to pay to work with you, or advertise on your blog. In addition, to this, can I expand the blog to include not just the direct revenue it can generate, from advertising and promotional posts, but how about the indirect revenue that can be provided through services that YOU provide. What skills can YOU offer? Perhaps these skills have grown from your experiences as a blogger and beyond. For example, I work with Marketing at Truprint on their social media thanks to the experiences that I have had with KiddyCharts – what could you do? Perhaps you can design recipes? Take photographs? Create other people’s WordPress sites? Take a look at your skillsets and think about where your strengths lie to grow your services beyond the blog. Be honest as well, the skills you have need to be sellable, and of a high enough quality to add value to other business and individuals. What risks do I want to take? Are you happy for the aesthetics to change so you can include adverts on the site? If so, by how much? Are sidebar ads OK, but text ads that highlight words within your blog posts not OK? Are you will to try these out? If you are – what earnings would you expect from them to make that risk worth it? As an example, I recently gave over a featured article spot on my homepage for an advert. In two months, it earned me just over £12.00…so it has now gone! Do you want to risk a search penalty? No-one has heard of dofollow and nofollow links until they start blogging – its all geek magic! However, if you are paid for a link then Google terms and conditions state that you need to make this link nofollow so that you don’t pass on any good link juice to the site you are linking to. If you don’t, you risk losing a fair chunk of your search traffic. Is this a risk you are willing to take? Are you prepared to risk losing some of your readers? It is hard to balance content on a monitised site. Sometimes you are asked to promote a lot of content within a week, and none the following week. How do you think your readers will react? Is that content interesting to them – can you make sure it is? If so, how much time will it take to create the content that your readers will continue to love? Whenever I am approached by a brand to work with them, I ALWAYS try and make sure that the content I write is still relevant to the KiddyCharts brand and audience. Is it about parenting? Does it solve a problem or a challenger? Can I give it a family angle? I want my readers to stay loyal, even though it means more work. Sometimes you might be willing to risk taking on a piece of work that could lose you readers, but how much you do this all depends on your appetite for risking your readers. Remember if you annoy them too much, they will go elsewhere. What investments can I make? Investment isn’t all about money…. When you start blogging for revenue, you HAVE to be able to sell. You can’t be embarrassed that you are shouting from the rooftops about how good you are at whatever it is you are offering your readers. You need to be able to talk about it with confidence, and explain why you are able to deliver better than the next man, woman or blogger. If this makes you feel too uncomfortable, then it may be harder for you to generate revenue. That doesn’t mean that you can’t, it just means that perhaps you need to think of selling in different ways. You may also need to give yourself more time to achieve your successes, or even lower benchmarks for those successes. 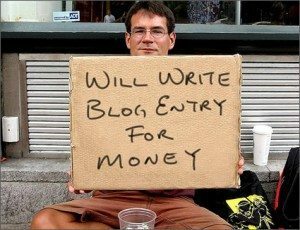 What will be MY sign of success for when I make money blogging? This is THE most important question for starting to make money from your blog. What is YOUR idea of success for that monitisation – if its one post a month that pays, or one campaign, then that’s fine. If its that you want this to be a solid income, like I decided before I began KiddyCharts, then that is fine too. Give yourself a timeline, but bear in mind that blogging success doesn’t happen overnight. It can take two to three years for most businesses to come into profit. Blogging can be just as tough if you are running it like a business. Remember though, whatever your answers to these questions, that your worth as a person ISN’T about how much money you make. It took me a while to work that out about for myself. In fact, it took this blog, and the success it has had to make me realise that I am not defined by the contribution I make to the family coffers, but by much more important things. Things like the love and guidance that I give my kids, and the time we take to have fun together. Given that, you may very well decide that your blog is your space and you don’t want to monitise it. And that’s cool too. Blogging, like anything else in life, is about finding that balance between work, rest and play. It doesn’t usually involve a Mars Bar though…however sometimes chocolate does help. Do you have anything to add? Do feel free to comment, and contact me as well if you have any questions, I am always happy to help out where I can. Thanks you touched all the important thing. i like your post and the way your blogging and providing the meaningful question and answers. Bless you my dear – thanks again for your support and your comments. Glad you missed the session, it wasn’t for you – you have to follow what you feel is right for you and the blog…and your way is the right way!